In the months following the 9-11 attacks in New York City and Washington D.C. the entire free world stood together with the United States against this unknown and faceless enemy, called islamic terrorism. Together, Europe and America were engaged in a war without precedent in our nations' common history. After the invasions and occupations of Iraq and Afghanistan, this band of brotherhood between our two great nations vanished. Anti-Americanism became a new hype among Europeans, and even after the Madrid and London bombings, the indulged European people refused to accept this challenge and turned off the friendly reached out hand of our staunchest and most valuable Transatlantic ally, the United States of America. In 2005, the Euramerican Friendship League was founded by some liberty-minded youngsters from all across Europe, including myself, to become a harbor inside the European Union, a forepost of friendship. The European and American peoples have more in common which each other than with all other nations on the face of the Earth. We share the same tradition, the same philosophic views, the same political achievements, the same culture and - above all - the same strive for individual liberty, prosperity and freedom. Europeans should never forget, as the Irish statesman Robert McCracken puts it, that men first crossed the Atlantic not to find soil for their ploughs but to secure liberty for their souls. Let us make sure that this proud heritage and mutual friendship will not perish in our hands. Europe is known as the birthplace of liberty, democracy and civil rights. From the Greeks and Romans in Ancient Times, over the century-long British struggle for government reform, to the French Revolution and the ideals of Enlightenment, Europe has always been the summum of civilization, based on libertarian rights and liberties. Today, Europe is divided. We have abandoned the path of our ancestors, and have forgotten the core of our legacy, while cultivating the arrogance around it. By letting our closest friends down and by refusing aid or advice from them, purely out of mere gloathing and envy, we have initiated our inexorable march towards tyranny ourselves: We have handed over our most basic civil rights to our governments. We have sacrificed and surrendered our liberty in order to obtain temporary security. By attacking the American society and by creating Soviet-style welfare states in Europe, we have planted the seeds for our own decline. Europe was wrong. America was right. While Europe's inevitable downfall and the collapse of all it represents is near, the United States are as healthy and strong as they have always been. They have succeeded throughout history in establishing a great new society - out of nothing - based on all the principles we once cherished and cared for as well, but for some reason have lost along the way, along the road to serfdom. So when looking at the other side of the Atlantic Ocean, instead of showing hatred, arrogance or jealousy, perhaps we can show our gratitude for all what they have accomplished for us, in times of peace as well as war. And for as long as the United States remain strong, Europe will be strong as well, since no American administration will ever let Europe down. For them, as former U.S. Congressman Robert A. Taft once put it, Europeans are just Americans whose ancestors missed the boat, and they deserve the same freedoms Americans at home enjoy. Perhaps we can learn from them, rather than be so full of ourselves and make silly arrogant remarks about their society. So when looking at the other side of the Pond, staring at Lady Liberty in front of the world's biggest skyline, we can still see the torch of freedom glowing, enlightening the entire world and hopefully, once again inspiring Europe, since the cradle of civilization is desperately in need for inspiration today, especially after the Irish rejected the second draft of the EUSSR's Constitution. Perhaps, the outcome of the Irish referendum can be a fresh start for Europe and evolve into a more profound Euro-American partnership. The death of Lisbon can hence become the resurrection of the Transatlantic alliance. So what is the Euramerican Friendship League? 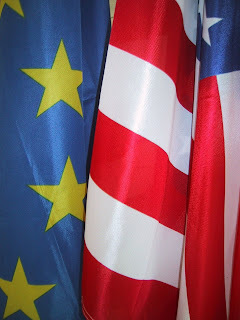 The Euramerican Friendship League is a Belgium based non-partisan organisation aiming to foster respect and understanding between the United States of America and the European countries, old and new Europe alike. EFL is convinced, in spite of all grievances, prejudices and differences that may exist, that the United States remain Europe's staunchest and most reliable ally in the whole wide world, and vice versa. EFL was founded to counter emerging anti-American tendencies among European elites, leftist media, environmental wacko's, welfare state addicts, peaceniks, champagne socialists, One World prophets and the inquisition of political correctness. How can I become part of the EFL community? Since the Euramerican Friendship League mainly focusses on defending Euro-American cooperation and the transatlantic alliance in everyday discussions with other citizens, media outlets, policy makers, business leaders, political advocates and a wide variety of institutions, and hence needs a very loosely organised structure, the EFL board is open to everyone interested in our mission and willing to collaborate with like-minded people from all accross the Euro-American axis in the pursuit of better relations and understanding between the two sides of the Pond. Only loyalty towards the goals and purposes of EFL, decent and lawful behavior in the representation of EFL with respect for the basic rules of courtesy and decency, and some degree of serious personal engagement is required. So if you are interested in joining the EFL board, please send them a message with some general information about you. How can I contact the Euramerican Friendship League? If you have a question or remark, are interested in joining the EFL board or have noticed severe anti-Americanism in your community and wish this to be put to an end, please send us a message or file us your report. We will come back to you ASAP. And let there be no doubt about it: EFL is ready to answer your call, whatever your call. You can reach EFL through their website: http://www.euramerican.org. Picture of U.S. 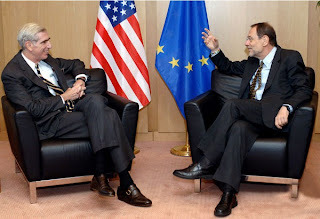 Ambassador C. Boyden Gray with Javier Solana, the EU High Representative of Foreign Affairs, somewhere in Brussels. 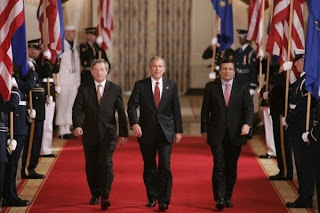 Picture of Luxembourg PM Jean-Claude Juncker, U.S. President George W. Bush and José Manuel Barroso, President of the EU Commission, at the 2005 Euro-American summit in Washington D.C.
Anonieme, ik zie niet in waarvoor ik mij hier zou moeten verontschuldigen. Ik spreek overal over "European countries" en over "Europe" als verzamelnaam daarvan, niet over "European Union" of wat dan ook. Ik gebruik de Europese vlaggen om alle landen in Europa te symboliseren, niet enkel die van de EU. De blauwe vlag met gele sterren is trouwens NIET de officiële vlag van de EU (want de legale basis daarvan stond in het door de Ieren verworpen Verdrag van Lissabon), maar wel de algemene vlag voor het werelddeel Europa. Ook de Raad van Europa (die niets van doen heeft met de EU as such) gebruikt dezelfde vlag. Europa is in mijn tekst gewoon de naam waarachter alle landen van het werelddeel Europa schuil gaan. Het gaat blijkbaar om een 'anonieme' die meent van een monopolie te bezitten op de betekenis (of interpretatie) van woorden als "Europa" en "Europees". Hij zal dus wel gemakkelijk "met verstomming" geslagen kunnen worden wanneer zijn orthodoxe 'zekerheden' in vraag komen te staan. Noteer dat hij - met zijn schampere verwijzing naar "Engelstalig artikel" - zelfs enigzins impliceert van te denken dat Engels geen 'echte' Europese taal zou zijn. Nou ja, van kleinzielige Europeanen (of eender welke soort van kleinzielige mensen op eender welk geografisch werelddeel) kan men 'alles' verwachten.